Skydive Midwest is truly a family business. The George family members all participate directly in the things that make Skydive Midwest so special. They all love to skydive and are passionate about sharing that experience with others, and it shows. Keith George is an avid skydiver and commercial pilot. Keith started skydiving in 1997 and has logged over 15,000 jumps since then! He turned his passion for skydiving into a business in 2008 when he bought Skydive Midwest. Keith is a Multi-Rated Commercial Pilot, Tandem Instructor, Aerial Videographer, Accelerated Free Fall Instructor, Coach and an FAA Certified Rigger. Keith has worked extremely hard to build Skydive Midwest from a small drop zone that primarily conducted only tandem skydives to a major Midwest/Chicago area DZ. He has also focused much of the businesses efforts and resources on creating more licensed skydivers and helping those already licensed to achieve all their goals in flight. Keith enjoys free-flying with his wife and 2 sons when he’s not flying the airplane or doing working jumps. Megan George partnered with Keith in Skydive Midwest in 2011. They met when Megan was learning to skydive in 2010. Megan is a Private Pilot, Accelerated Free Fall Instructor, Coach and FS Competitor. Megan is a sponsored athlete and holds several skydiving records as well as being a 2 time National Champion Skydiver in 4-Way FS. During the week, Megan works as Chief Financial Officer, Bookkeeper, Event Coordinator, HR Director, and Marketing Manager for Skydive Midwest. On weekends Megan trains with Skydive Midwest NEXT XP and coaches and mentors other teams and jumpers. Austin George is Keith’s oldest son. He began working at Skydive Midwest when he was 12 years old, packing his dad’s parachutes. 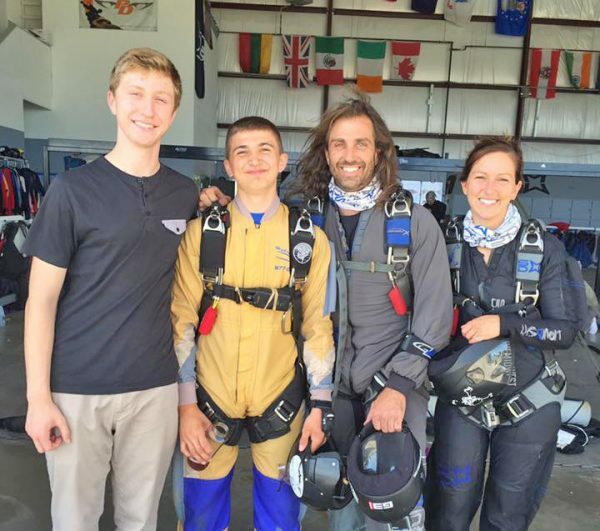 At just 16 years old Austin became a licensed skydiver (by USPA waiver) and has been jumping ever since. At 18 Austin became an FAA Certified Rigger and is often found in the drop zone’s rigging loft, packing reserve parachutes. Austin enjoys aerial videography and photography and assists in the management of the marketing and social media at Skydive Midwest. Ryan George is Keith’s youngest son. At only 16 years old he recently became a licensed skydiver (by USPA Waiver). Ryan works hard packing parachutes every weekend of the summer! Every chance he gets, he is up in the air logging more jumps. It is impossible to keep this kid’s feet on the ground!